We are an experienced, friendly and proactive team who can provide a range of services for your business. Peace of mind when you need it most. By providing our own out of hours service, your pet will be seen by their own vet at all times – day and night! We provide a primary service for horse owners, offering a professional, efficient and compassionate service to our clients and their horses. Are you looking for a caring, dedicated and enthusiastic vet practice? Are you looking for people you can trust with your family pet or your farming business? Having serviced the animals in the heart of Ayrshire for over the last 30 years we are ideally placed to look after your pet or your farm businesses every need. Ruby is a 9 year old, neutered, female KCCS. Ruby's owner was concerned Ruby may be overweight - she was not tolerating heat, always choosing to sit or lie down, panting and becoming very intolerant to exercise. At Ruby’s initial weigh-in - October 2017, she was 16.25kg. 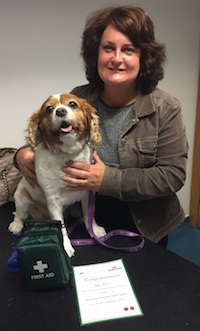 Since attending our weight clinic, Ruby has lost an amazing 3.05kg, making her final weight today 13.20kg. Since Ruby’s first consultation with our nurse Eilidh, her clinical signs have very much improved. Mrs White also reports that Ruby is much more active. A huge well done to Ruby and her owner. If you would like to bring your pet for a complimentary assessment please contact the surgery.